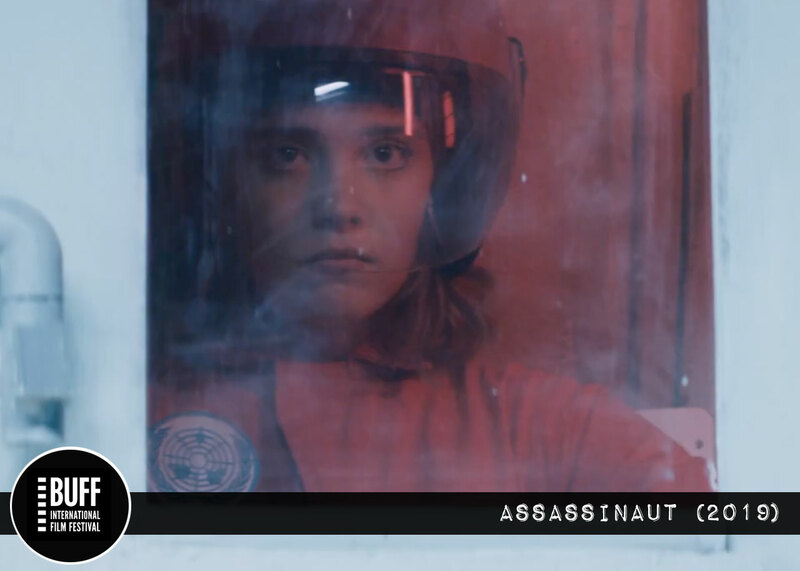 Featuring a stellar young cast and great practical effects, “Assassinaut” is a flawed but promising sci-fi / horror story that brims with emerging talent. I salute the makers of Assassinaut for their ambition. Though, in the end, it’s easier to admire than to love. It’s a sci-fi/horror film that frequently overcomes obvious budgetary limitations in some key areas while falling short precisely where movies of its ilk need to shine brightest: the script. The story opens with the assassination of Earth’s president, who supports a peace treaty with an alien race. That dream dies with him, leading to a nuclear conflict. There are indications of a conspiracy theory, which is one of several story threads to be introduced and never explained fully, let alone resolved. Flash forward a decade, and a group of youth is being assembled for a trip to a distant space station where they will visit the current president for reasons that also aren’t spelled out. The minimal world-building neglects to clearly define the bigger picture too; significant details like the precise nature of this Earth government or even, for that matter, its relationship with the aliens. In any case, the political backdrop ceases to matter altogether once the story proper gets underway: the space station is destroyed in an attempted assassination of the president, stranding her, four of the kids, and a military officer (Vito Trigo) on the alien planet the station had been orbiting. At the risk of this review becoming as cumbersome as Assassinaut’s plotting, it should be noted that Vigo (credited only as ‘The Commander’) is a prominent part of the film’s prologue. It’s suggested later that he’s embittered over the death by nuke of his family, but he’s also the very person who killed the peacenik president, which seemingly set the missiles flying in the first place. So his motivations are at best murky, at worst contradictory. All that backstory is abruptly rendered moot anyway when The Commander falls into the villain role as the story shifts to a rather rote stalk and kill scenario that didn’t even require such a complex set-up. He winds up shepherding the kids as they journey to rescue the injured president. On the way, it becomes clear the alien world is quite hostile to humans; a tricorder-style device reveals that much of the local fruit is deadly. Still, with all the logic of the lamentable Prometheus, he catches and cleans a fish-like creature that, shocker, infects him with a parasite that stirs homicidal urges. So just what did I admire about Assassinaut? Well, as Michael Winterbottom did with the wonderful Code 46, writer-director Drew Bolduc (The Taint) makes some smart location choices that help give things a reasonably futuristic look at no cost. The effect is undermined by the many contemporary parked cars crowding the exterior backgrounds (there are an awful lot of minivans for a post-nuke world), but I’ve got enough good will for the filmmakers to accept this as an alternate timeline rather than the far future. That works. There’s also a good deal of very wet practical gore present, thanks in part to Bolduc himself, who’s also credited as an effects technician. Impressive. And, while I’m very much of the “even bad practical FX beat CGI” school of thought, I’m not damning it with faint praise; it’s truly great work. We’re introduced to the lead kid (Shannon Hutchinson as Sarah) in a cool black and white scene where she fights and gorily kills a nifty-looking alien. It turns out she’s actually just playing with her little brother, which is disappointing. I can’t help but think there’s a whole other, better movie about a teenage girl battling aliens waiting to be extrapolated out of that scene. The performances are hit and miss, which isn’t a surprise at this budget level, but most of the younger actors acquaint themselves quite well; in fact, they’re consistently better than their adult counterparts despite being handed such thinly sketched characters (one’s a smartass, two are practically interchangeable nerd/overachievers, and the fourth has no distinguishing features I could recall just hours after watching). Hutchinson especially manages to transcend the script issues to create a compelling and believable young hero; somebody get her in a bigger movie, please. And there’s one upside to the mostly shaky script (semi-spoiler): it is fearless and unsentimental in killing off some of the kids, which is always to be admired. In all, Assassinaut falls short of the profundity one imagines Bolduc was striving for, but hits enough grace notes (and credit for many of them belongs to cinematographer Kunitaro Ohi, whose work elevates the whole enterprise) that it can’t rightly be dismissed as a case of reach exceeding grasp. I’d humbly suggest it’s a flawed work, but one showing the great promise of several emerging artists. This review is from the U.S. premiere of ASSASSINAUT on March 24 at the Boston Underground Film Festival.